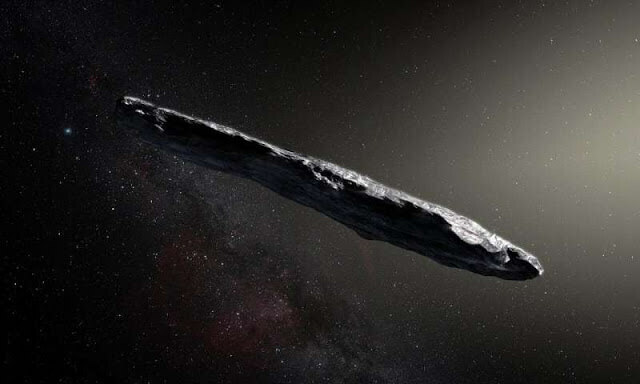 The mysterious interstellar cigar-shaped object might have been an ancient alien relic, researchers have suggested. On October 19th, 2017, the Panoramic Survey Telescope and Rapid Response System-1 (Pan-STARRS-1) in Hawaii announced the first-ever detection of an interstellar asteroid, named 1I/2017 U1 (aka, "Oumuamua). 'Oumuamua which has a half-metre thick shield appeared without warning , zipping through the solar system from above. After months of analysis of the little data collected, scientists in June declared it was a comet. Its strange movements were blamed on gas, but researchers at the Harvard Smithsonian Center for Astrophysics now say that might not be the case. They're suggesting it sped up as it rounded the sun, rather than slow down, because it had a sail. "We explain the excess acceleration of 'Oumuamua away from the sun as the result of the force that the sunlight exerts on its surface," researcher Abraham Loeb told space news site Universe Today. "For this force to explain measured excess acceleration, the object needs to be extremely thin, of order a fraction of a millimetre in thickness but tens of meters in size. This makes the object lightweight for its surface area and allows it to act as a light-sail." But where might the space-yacht have come from, and who built it? They're not so sure, suggesting it could have formed entirely naturally - or belong to a long-gone ancient alien civilisation. "The assumption that 'Oumumua followed a random orbit requires the production of 10^15 such objects per star in our galaxy. This abundance is up to a hundred million times more than expected from the solar system, based on a calculation that we did back in 2009 - a surprisingly high overabundance, unless 'Oumuamua is a targeted probe on a reconnaissance mission and not a member of a random population of objects." 'Oumuamua was only barely spotted, and American theoretical physicist Prof Abraham Loeb suggests there could be many, many more probes just like it buzzing by, without us noticing. The idea of a solar sail isn't science fiction - Japan launched a probe in 2010 called IKAROS which uses a sail as its main form of propulsion.